This duck confit is relatively quick and easy compared to the traditional method. The duck legs are marinated overnight, and then they're browned and slowly baked for 3 hours. This is a shortcut recipe, but the duck legs come out tender and delicious in a fraction of the time. Serve the duck with a potato gratin or roasted potatoes. Place the duck legs in a shallow baking dish or pan. They should fit in without crowding. In a small bowl, combine the salt, pepper, thyme, crushed juniper berries, and crumbled bay leaves. Rub the duck legs all over with the mixture. Cover the dish with plastic wrap and refrigerate overnight or up to 24 hours. When you're ready to cook the duck, heat the oven to 325 F.
Pat the duck legs with paper towels to remove any excess moisture. Do not rinse. 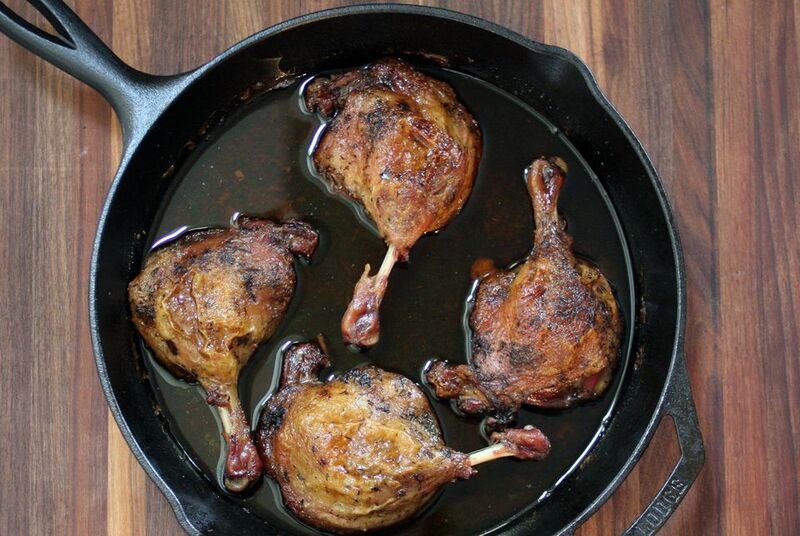 Place the duck legs, skin side down, in a large, heavy oven-safe skillet over medium heat. Cook them for about 8 to 10 minutes on each side, until browned and you have plenty of rendered fat. In a 10- or 12-inch iron skillet, you should have about 1/4 inch of fat. Add more duck fat if you need it. If the skillet is not oven safe or isn't large enough to fit the legs, move the legs and fat to a baking pan just large enough to fit. Cover the skillet or baking pan tightly with foil. Bake for 2 hours. Remove the foil and continue baking, with the legs still skin and fat side up, for 1/2 hour. Pour off all but 1 tablespoon of the fat and continue baking, skin side up, for another 30 minutes.